Details have this week been leaked for the new AMD Vega GPU processors revealing details about the new AMD Vega 10, Vega 20, and Vega 11 ahead of their expected rollout sometime during 2017. The details have been leaked via the same source but confirmed mobile Polaris specs weeks before it was released, say the VideoCardz website, which writes a little more information about each new AMD GPU. Vega 10 will be released in first quarter of 2017, it has 64 Compute Units and 24TF 16-bit computing power. Vega 10 is based on 14nm GFX9 architecture. It comes with 16GB of HBM2 memory with a bandwidth of 512 GB/s. The TBP is currently expected at around 225W. Meanwhile, dual Vega 10 will be released in second quarter of 2017 and TBP should be around 300W. Now here’s something interesting that we didn’t know yet. Vega20 will use 7nm GFX9 architecture. It will feature 32GB of HBM2 memory with 1 TB/s of bandwidth. TBP is around 150W and it will support PCI-Express 4.0. It will also have 64 Compute Units. So what does GFX9 really mean? It’s an internal codename for architecture, for instance Hawaii was GFX7 and Polaris was GFX8. 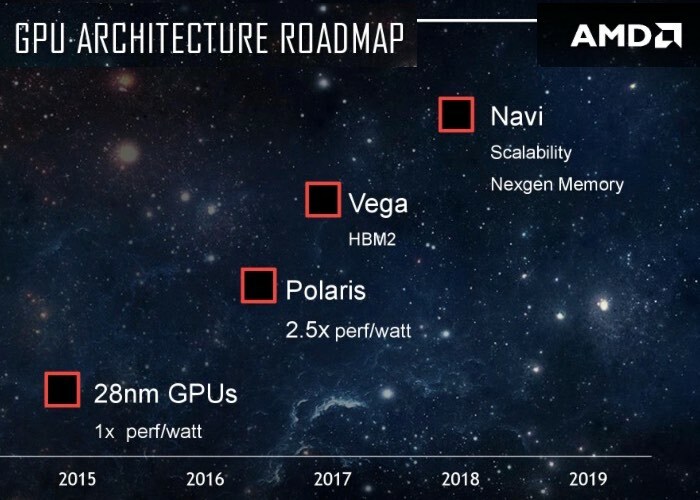 We have also learned that AMD is planning to replace Polaris 10 with Vega 11 next year. The specs were not released and we can only expect Vega 11 to share the same fabrication node with Vega 10 (14nm). If our source has correct information then Navi 10 and 11 are currently planned for 2019. It means that roadmap has changed and Navi is pushed back one year in the schedule. Unfortunately no information on pricing or worldwide availability has been released or leaked as yet, but as soon as information comes to light we will keep you updated as always.